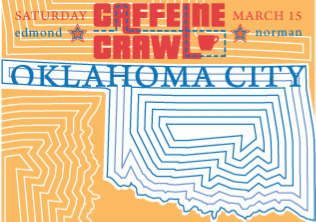 OKC welcomed us to its second annual sold-out Caffeine Crawl with gorgeous weather and local enthusiasm. We slid behind the wheels of our sleek red rides from our Perfect Crema sponsor, Fowler Auto, and off we went! Crawlers began the day around the city at our three Roaster Sponsors - Coffee Slingers, Elemental Roasters, and Mariposa - who welcomed us with smiles and the smell of great coffee. Crawlers arrived and grabbed burlap bags filled with swag from Wholesome Sweeteners, Barista Magazine, Yelp, and participating shops. Anyone in need of breakfast at Elemental coffee before getting started was well taken care of at their homemade crepe bar - yum! We gathered around the red roaster to learn about coffee processing at origin while sipping a great Yirgacheffe, and admired the sweet Stella di Caffe custom Barista Nation espresso machine with Brian from Double Shot sponsor Unic. Joe from Single Shot sponsor Sleeve a Message also came along for the ride. Coffee Slingers gave crawlers a great origin immersion experience in their roasting space, complete with slideshow and samples. We passed around glass jars of coffee beans, noting the differences, and felt quite involved as we sat next to bags filled with green coffee, waiting to be roasted and brewed into the delicious cup we were drinking. The enthusiastic staff at T - an Urban Teahouse informed us about tea processes with awesome style and energy, and questions flowed as crawlers sampled its savory Oolong. Crawlers headed to Syrup for some unique espresso cakes and a sampling session of 4 different Stumptown brews, while Crimson & Whipped Cream highlighted a variety of cold drinks like chai and cold brew lattes. Gray Owl in Norman provided cold brew and house-made pastries to snack on while we learned a little coffeehouse culture history, and we wrapped up our time there watching (and sampling!) a fascinating siphon demo. Moving along, we found ourselves in front of the scrumptious pastry case at Cuppies and Joe, where we sipped espresso milkshakes out of Mason jars and sampled tiny tiramisu cupcakes in its cozy back room. Mariposa provided a great discussion on clean water, social justice, and brew methods, and we sampled delicious coffee, Cascara tea, and Lavender cake from a local bakery. Crawlers mingled happily and wandered outside to check out Mariposa’s charming coffee truck, which was serving up samples of a coffee beer from a partnership with a local brewery. We said a fond farewell to our Corollas at Fowler Auto before heading to Café Evoke in Edmond for a fantastic after crawl party! Happily caffeinated crawlers chatted over beers (or more coffee!) and snacks, and entered in the raffle to support the OKC Regional Foodbank. Winners went home happy with awesome prizes from Bhakti Chai, Unic, and Baratza. Thanks for an awesome Crawl, OKC – we’ll see you next year!